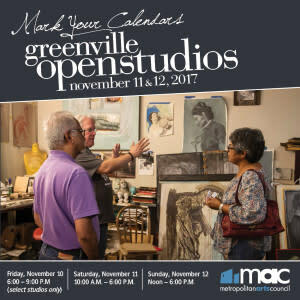 Greenville Open Studios allows you to experience the life of local artists at work in their studios for one full weekend this November. Engage with our community's incredible talent, learn about artistic processes, enhance or begin your art collection and become inspired. Greenville Open Studios is a weekend event which opens the studios of local visual artists to the public. The event is held annually on the first weekend in November, and showcases artists at work in their studios. Studio locations vary throughout a 15-mile radius of downtown Greenville with Easley, Greer, Travelers Rest and Dacusville included.